BAXT, a new British brand of premier finishing solutions and part of the AMBA group, has announced the launch of the WP10 Spray Booth Wall Protector, a quick, hassle-free way to protect your spraybooth walls. 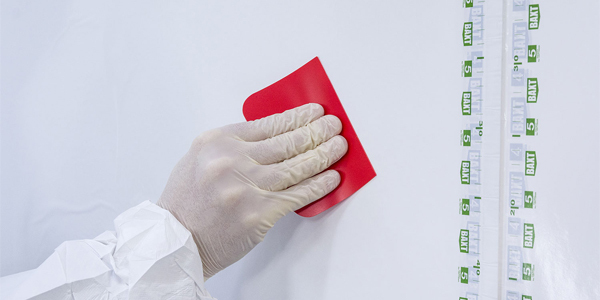 Rather than removing the entire coating from the spraybooth wall and re-applying every couple of months, the WP10 is constructed with five peelable layers which can be easily and quickly removed to reveal a fresh, clean surface whenever necessary. This minimizes downtime of the busy paint shop and thus increases productivity. The latest client to take advantage of the WP10 Spray Booth Wall Protector is Prodrive, a world-renowned motorsport and advanced technology leader. Prodrive’s spraybooths are used daily, and the paint shop department required an efficient method of maintaining the booth to minimize downtime. Direct Tool Company offered a one-month trial of the WP10 solution to Prodrive, which resulted in a follow-up order consisting of multiple rolls. For more information on the WP10 Spray Booth Wall Protector, click here.